For too many years I headed into the fall season relying solely on mums to provide the major blocks of color to my garden. No longer. Asters (and I’m going to dispense with the italics, let’s just pretend I’ve switched from the Latin to the common name) are an indispensable ally in the northern gardener’s quest for sassy September and October bloom. You’ll sometimes hear them referred to as “fall asters,” since all but a few varieties save their stuff for football season. Sure, they have some fungus problems — I have some very tall, old dogs that make it every year to astounding bloom, but usually enter the game in the fourth quarter with seventy percent of their leaves turned brown and crackly, whether I’ve kept at them with a fungicide application during the summer or not. But they’re at the back of the bed, hanging out with the Boltonia, so all you see is their riveting violet purple color being projected from medium-sized, daisy-like flowers. All asters are derived from the dozens of native species that abound in many parts of the globe, so even the fancy, high-priced nursery cultivars evoke a certain native noblesse. The tall ones I mentioned are the New England Aster (A. novae-angliae) which top four feet in one of my front beds, so staking is necessary. But staking a mature tall aster might mean dealing with 20 or more stems, so I circle my tall asters with wire hoops held about halfway up. I also grow the very popular A. x frikartii ‘Monch’ which grows to thirty inches and flails out rich lavender blooms, which look lovely dancing above and between the Solidago I plant in front of it. The shortest variety I grow is the 12-inch tall ‘Professor Anton Kippenberg,’ a terrific little guy with rich lavender blooms. There are many, many, many other sub-groups and varieties within the groups. But since nearly all of them are hardy to -40 degrees, it’s worth the time to get to know the genus and sort out what you like. With a wide range of heights, asters can fill in anywhere in the herbaceous garden. While they are a sun-lover, they do fine in my less-than-full-sun garden, but will disappoint in true “part shade.” They like soil with good organic content kept evenly moist, and prefer that their roots be kept cool. In clay or non-draining soils, they can rot out on you fairly quickly, but in well-draining soils can easily last five to 15 years. 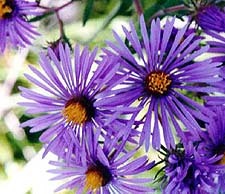 Asters benefit from division about every three years. Divide in the spring by digging up the plant and either ripping the clump apart or cutting it apart with a long serrated knife. Asters are not huge feeders. I give ’em a little 10-10-10 in the spring and try to remember to give them a second shot in mid-August, as buds are starting to form. Asters flower in a variety of purples, blues, pinks, reds, and white, and look great with other fall-bloomers such as Sedum, Boltonia, Solidago, Cimicifuga, and grasses. They are a wonderful cut flower, and are also handsome when dried.